I must say… I LOVE Valentine’s Day. As a child, my parents would make me cute little Valentine’s Day gift packages full of stickers, candy, and stuffed animals. I loved picking out Valentine’s Day cards for my friends and making heart shaped cookies. Valentine’s Day is just fun… period. 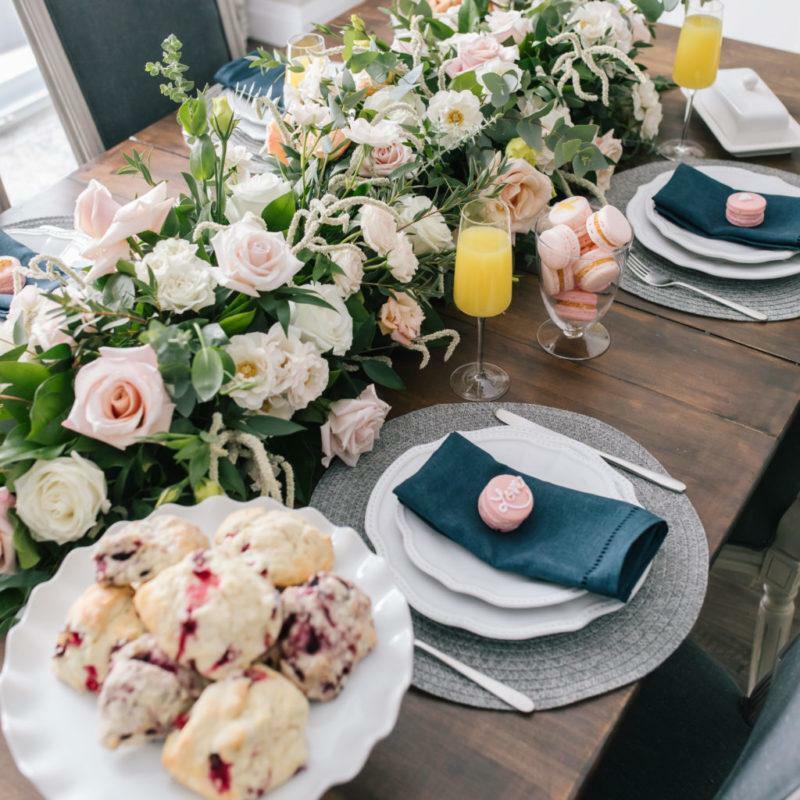 If you’re looking to do something a little bit different this Valentine’s Day, consider hosting a Galentine’s brunch with your besties. 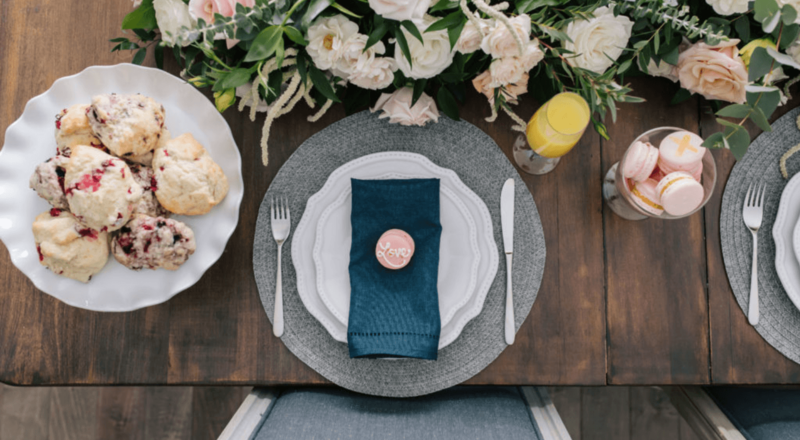 Pop the champagne, indulge in some sweets, and make time to catch up and enjoy time together. Next, is the dinnerware. I used simple white bevelled plates for a feminine ‘look’, and added these navy blue napkins for a pop of colour. 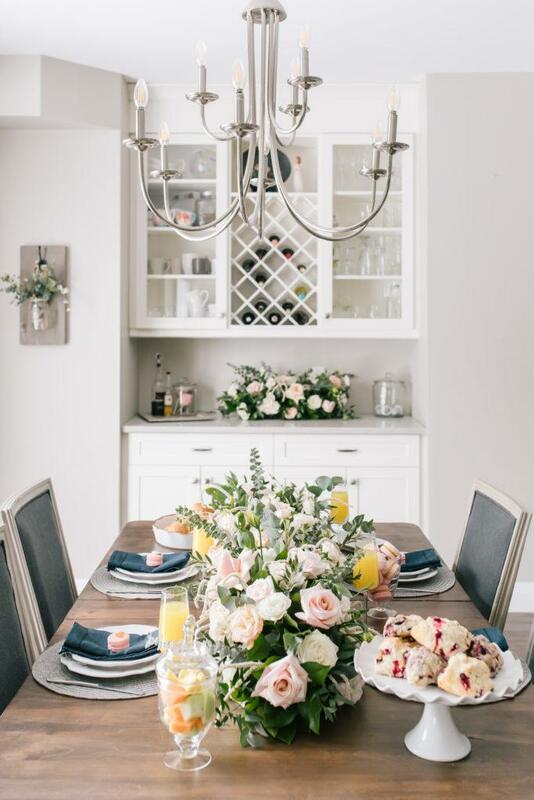 When you can mix in different sized cake stands, jars, and bowls it will add a unique flare to the tablescape. I love this bevelled white cake plate and I used these bathroom jars as part of my tablescape because I thought they looked so pretty and feminine! Next is food! I decided to make this brunch really simple, but delicious. Instead of doing a full meal, I served beautiful raspberry scones, fresh fruit, pink french macarons, strawberry smoothies, and croissants. I always buy my desserts from Stacey at Sweet Bakery Brant, because she’s an incredible baker and everything I buy from her is delicious! 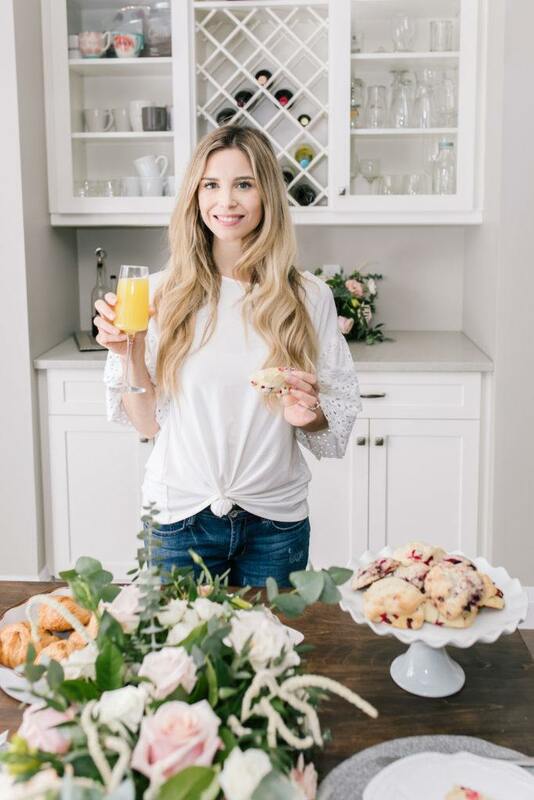 Her French Macaroons are AMAZING, and she has shared her special recipe at the bottom of this post in case you’d like to make them yourself! 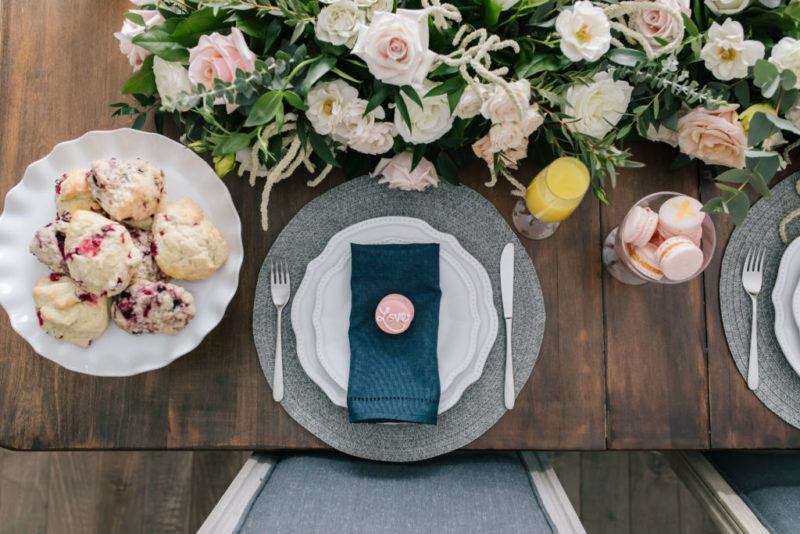 Creating a gorgeous Galentine’s brunch doesn’t have to be complicated. Create a space that feels relaxed, beautiful and inviting for your guests to feel at home. And obviously, your company is the most important part of it all! Happy Valentine’s month, loves! 1. Place almond flour and confectioners sugar in a food processor. And process for about 15 seconds. Soft the mixture into a bowl. 2. Line two sheets with parchment paper. 3. Place the egg whites in a large bowl and whip until holding soft peaks. Gradually beat in the superfine sugar until firm and glassy. Beat in the vanilla. 4. Using a spatula fold the almond mixture into the meringue one third at a time. When all dry ingredients are thoroughly incorporated, continue to cut and fold the mixture until forms a ribbon like consistency. 5. Pour the batter into a pastry bag fitted with a 1 cm round tip. Pipe desired circles on the prepared sheets. 6. Tap the baking sheets firmly to remove air bubbles. 7. Let stand at room temperature for 30 minutes. 8. Preheat oven to 325 degrees. 9.Bake in preheated oven for 10-15 minutes and cool for 10 minutes. 10. Peel carefully from sheets and fill as desired. To make the filling cream butter and add icing sugar, milk and vanilla until fluffy. Use a piping bag to fill centres. *For additional recipes from Stacey at Sweet Bakery Brant, visit her TV show webpage ‘Sweet Occasions’ for some yummy ideas! Tag us on Instagram at @honestly_alexandra and @kspstuff so we can see how you’re celebrating this year. Be the first to know about our latest deals and promotions. Head on over to our website, enter your email address and get ready for all the perks and inspiration we’re sharing.